I missed it last year, but Olympia Beauty Show is an event that is very important to me. This is one of the nail industry's leading international shows and competition arenas. 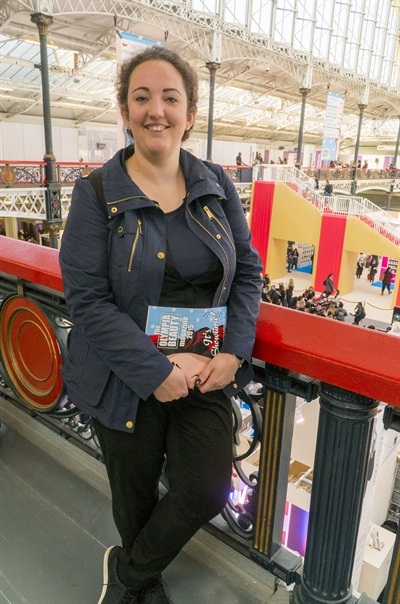 It's held in London's Kensington Olympia, a stunning Victorian structure with magnificent galleries and an ornate barrel-vaulted roof. Olympia Beauty was home to Live Stages such as "The Advanced Beauty Conference" and "Scratch Stage" and of course "Nailympia London." 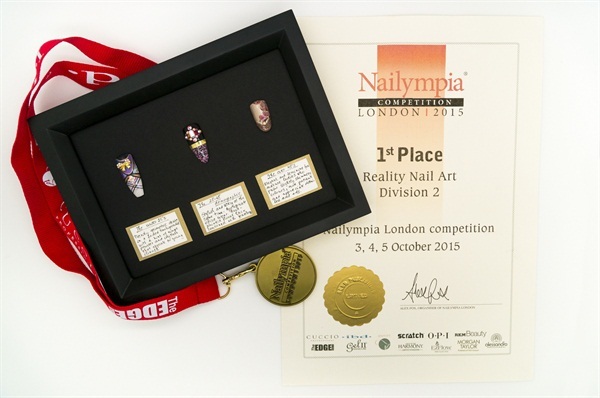 Nailympia London has returned for its 11th year, with 575 competitors from 22 countries. It is also a major exhibition hall with all the major companies showing their new products and many small, up-and-coming companies as well. Check out the number of competitions they have to choose from (with three divisions each): Liquid & Powder; Gel; Gel-Polish; Salon Nails; Stiletto Nails; Mixed Media Boxed Art; Runway, Reality; Fantasy; maybe even more! To get myself ready for competing I attended a presentation from IBD, in which I learned about creating new nail shapes and gel-polish nail art from Mike Blackham. 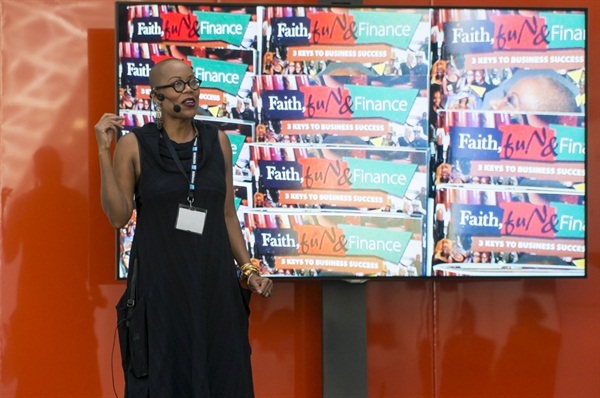 I also went to see the incomprable Maisie Dunbar, whose famous speech "Faith, Fun, and Finance" is so positive and inspiring. My favorite speaker on the second day was AthenA Elliot, who presented "The History of Nail Art USA." So now on to the competition. After being eliminated from NTNA this year I decided to have a look at the categories and rules at Nailympia. I was too late for anything in nail art except Runway and Reality. After submitting the application I got nervous because Reality is a new category this year; plus, you have to design reality nail art for three demographics and they can't be designs worn across Russia, the Baltic, or Asia. Ack! I didn't sleep much the night before. I had scoured the social media accounts of all my favourite US and UK nail artists and made loads of samples for each demographic. But since I had only entered a few competitions before I realized that time was going to be my biggest enemy. We were given 45 minutes for three different designs. Supplied with three long square nail tips we had to cut and shape them, then decorate with the following techniques: fading, etching, painting, striping, marbling, one stroke, blending. We could use acrylic paints, glitters, gel-polish, foiling, charms, rhinestones, flat stones, decals, and embellishments. Conjuring up the autumn/winter season, I designed around its colors and designs, using three different shapes: ballerina for the under 25 year old; almond for the 25-45 year olds; and rounded for those over age 45. Time's up! 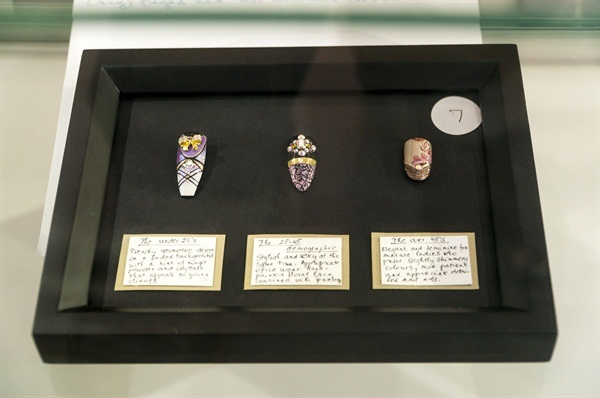 We left our nail art at our desks and wouldn't know the outcome until the next day at the Award ceremony. Here come the judges. So then people gathered around to hear the results. They called the third and second place winners. I was sad, but still so happy that I tried and got the experience. While I was thinking these things, there was a pause as the judges struggled over the name of the first place winner. To my great shock, I heard my name called out. I still can't believe it. What an honour to be judged by these respected judges and get such good scores! Of course now it means I can no longer enter in Division 2/Novice anymore.